In less than two decades the battle over local discovery has shifted from a five pound book filled with yellow pages that sits in the kitchen to a smartphone that you can access from anywhere. In the late 1990s companies including Microsoft Sidewalk, AOL Digital Cities, and CitySearch duked it out digitally to be the place people discovered a new restaurant or bar online, while print outfits like Zagat, Time Out, and local newspapers did the same in print. There were multiple ways to find a place to go in print and online. This isn’t really true anymore. Google, with it’s trifecta of Google Maps, Mobile search, and Desktop search fuels local discovery with a dominance that is daunting. Sure, there are other ways to find a great taco: Apple Maps exists; Yelp is still important enough to worry restaurants; Foursquare hums along quietly; and reservation apps can point the way. Instagram has the power to inspire, but you can’t ask it where to get a burger near you. Thanks to our reliance on smartphones and GPS, it’s become an indispensable tool for restaurants. At the same time, Google’s ad search business, allowing keywords to go to the highest bidder, change the way restaurants must market themselves. Over the last year the frequency of the search term “restaurant near me” has grown by two to three times in markets around the world. In no place has this search grown less than 50%. Indeed, the growing popularity of “… near me” searches clearly illustrates the consumer shift to a reliance on digital for the most basic local discovery actions at an incredibly high frequency that will only continue to increase as long as search results satisfy. According to Moz’s 2018 Local Search Ranking Factors Survey, 64 percent of marketers now see Google as the new “homepage” for local businesses. 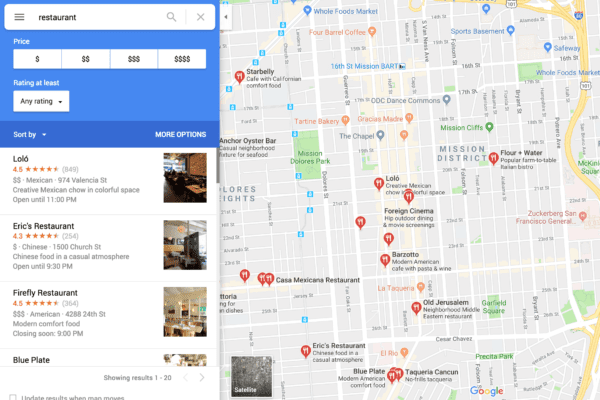 On desktop and mobile search, Google offers structured results for searches like “best burger in NYC” that take users to map-based lists that show photos, opening hours, delivery services without clicking through to another website. Recent partnerships with reservation services — Resy, OpenTable, SevenRooms — mean that diners don’t have to leave Google to book a table for dinner. If you don’t want to go for Google’s recommendations, you can find the recommendations of companies with pockets deep enough to show up high on Google results. For restaurants, there’s really just one company like that, the Booking Holdings-backed OpenTable. In the first nine months of 2018 the parent company spend $3.56 billion on digital marketing, the lion’s share of which went to Google. That’s why it’s easy for OpenTable to be placed high on the page even for restaurants that don’t appear on OpenTable. On Google Maps on smartphones, an upgraded “Explore” tab automatically suggests highly rated restaurants in the user’s immediate area (dubbed “The Foodie List”), even if the user isn’t necessarily searching for a place to eat. There are reservations apps that offer curated lists, too, but the cost of customer acquisition is high for any app, especially one that competes with Google’s products. This is why we are likely to see more consolidation like Resy’s purchase of Reserve late last year. In 2019, Google will likely increase its dominance thanks to smart moves in voice search, where “find me great seafood on the beach” is much easier to answer than “book a flight for a family of four to Amman.” For Android users, Google’s Assistant feature can pick out potential searches from other apps, such as texting with friends, in order to provide local and other results. It is also far ahead in meeting the needs of the next great search habit: personalization. Helping people decide what to do and answer the question, ‘What should I get for lunch?’ will push Google further along the road to local dominance.